Alpha Zero is a flyer based shooter set in space. You control an aircraft and destroy oncoming hoards of enemies and even bosses as the mission progresses. The game itself features rich graphics and even better sound but lacks in the control department. While variety is certainly there for control the default set is a bit of a hassle. Alpha Zero puts you in space and you fly across the map to take on enemies that basically come from all angles. Increased firepower/boosts allow you to take on enemies at faster paces. Boss levels take the approach of showing you their weak points and you have to maneuver to take those out. From missiles to regular fire the game has all sorts of fast paces particles flying across the screen from both you and your enemies. Indicators show enemies location before they appear allowing to plan your attack and position. The default controls are where I had the most gripe they require both of your thumbs one to move the ship and other to point the direction of shooting. This ends up countering each other as you block view of your ship this way and end up making hard to maneuver. Personally I prefer the analog controls they offer in the settings menu. Though points for variety being throw into the mix with 4 control options. 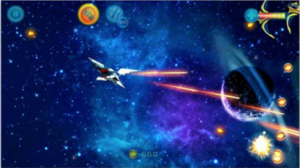 In summary its another maneuver and shooter game set in space with improved graphics and sub-par controls. Nothing really separates this game from the others but if your fan of spaceships and dodging fire from all angles then its worth a try but I’d say your better of with other titles in the app-store.